Let's say you're in a small shop at about 2 AM. You've got your feet up and you're reading the Sunday Funnies. Suddenly, EMS comes rolling in with a patient with crushing chest pain. Your EKG is done immediately, and while it does not show a STEMI, let's say it shows complete heart block with the rate somewhere in the upper 30's. Your local interventionalist/EP is aware and is en route in his Maserati but it's going to be a good 20-30 minutes before he'll arrive. You briefly consider transcutaneous pacing, but when you look back at your nice, cooperative, conscious patient and realize that deep down in your soul you're just not that cruel. Dust off that kit, because it's time to float a pacer, people! You might be thinking, "Transvenous pacing? Really? That made the cut?" We've chosen to highlight this procedure as it is, on paper, very straightforward, but in reality (as noted by several practitioners we've talked with), it can be filled with tons of confusing variables and details. True, one could always hit the "EMERGENCY" button when in doubt but we're smart enough to understand this on a more sophisticated level. Despite the haters out there, the evidence is clear that we can insert these just as efficiently and successfully as our colleagues up in the cath lab. 1.) Rate - How fast do you want them to go? It depends, but generally you want them above their intrinsic rate, or if they're also getting paced transcutaneously, above that. I've heard experts recommend going about 20 beats higher. 80 bpm is usually a safe place to start. 2.) Output - How much current do you want them to get? These usually run from 0.2 to 20 mA, and you'll want to start with it cranked all the way to 20 to ensure capture. You can adjust this later (and we'll address this again). 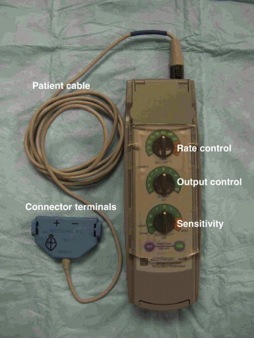 The Medtronic generator depicted has two settings for output, labelled "A" for atrial and "V" for ventricular. Since we're only going to be tickling the right ventricle in this situation, leave the "A" output at 0 at all times. 3.) Sensitivity - How well do you want your generator to detect voltage? It's a bit nonintuitive: the lower you set it, the more sensitive it gets. These go from 0.5 mV to 20 mV, so if you set it at 0.5 it will detect voltages down to that level. If it detects a native depolarization at that voltage and it's equal or faster than the rate you program, your pacer will not fire. Usually there's an asyncronous mode that just paces like a honey badger regardless of the intrinsic rhythm--and that's generally the setting you want to start on. These things run on batteries, so also make sure they've been replaced recently. Now hit the play button so we can insert this guy. We won't go into detail about placing the initial line as this should be obvious, but just remember that you'll need a introducer sheath in either the right internal jugular or the left subclavian (potential board question, people!). Get sterile, but you will need a non-sterile colleague to help you when it's time to attach the generator to the cable--unlike most emergency medicine procedures, this will become a two man (or woman) job at this point. First things first, be sure to check the balloon tip of the catheter, with the "special" syringe provided in your kit. Then pass your catheter through the sterile sleeve (make sure it is oriented properly so it will attach correctly to the introducer sheath) and slide it up to around 30 cm on the catheter so it is out of your way. DO NOT FORGET THE SLEEVE! It's very easy to proceed and realize you've forgotten this step once it's too late. Once it's on there it gives you a sterile mechanism to reposition the wire later on if need be. Next, you will begin advancing your catheter into the introducer sheath. An important steps that will help with successful capture will be keeping the catheter in its coiled form (as much as possible) as you advance it, with the tip curled towards the patient's left side. This will help with proper floating of the catheter along the wall of the RV. Now thread in your catheter, with the balloon down, to about 10-12 cm. Now, hook this guy up! You will need to have your trusty non-sterile assistant attach your line, with adaptors, to the connecting cable of the generator (which, needless to say, goes in the VENTRICLE port). The line marked "proximal" gets attached to the positive lead. If you have an alligator clamp, the distal lead should be hooked up to lead V1 of your EKG machine. This will put you into exploration mode. Now tell your assistant, "BALLOON UP!" and float that sucker! You'll need about 1.5 cc of air into the balloon, and move it downstream quickly. You're looking for a STEMI pattern as the catheter tickles the very arrhythmogenic endocardium of the right ventricle. Ultrasonography will also enhance your experience as you can directly visualize your wire abutting the apex. Once you're there, deflate your balloon, close it off with the stopcock, and then lock your line with your sheath. Plug the distal lead back into your generator connection cable (negative port), because it's time to rock and roll. Just like we stated earlier, set your rate at about 80, and then start with your output high. Sensitivity can be asynchronous here. You will need to assess for capture both electrically (QRS complexes that follow the pacer spikes) and mechanically (palpable pulses that correspond to your pacing rhythm). Slowly titrate down your output until you lose capture. It's generally accepted that your output should be about twice the threshold so you consistently get good capture. Always get a portable chest x-ray once your done to confirm placement, and to make sure you haven't caused any iatrogenic injury. Just as always, these writings and musings are for EDUCATIONAL PURPOSES ONLY. Listening to me babble does in no way shape or form make you an expert at floating these things. Be smart, because I know that you all are. Roberts and Hedges' Clinical Procedures in Emergency Medicine, 6th Edition. Chapter 15.